Summer is here! And so a lot of terrassen (terraces), café’s (cafés) and bars (bars) are flooded with people, trying to afkoelen (cool off) a little in the zomerse hitte (Summer heat). 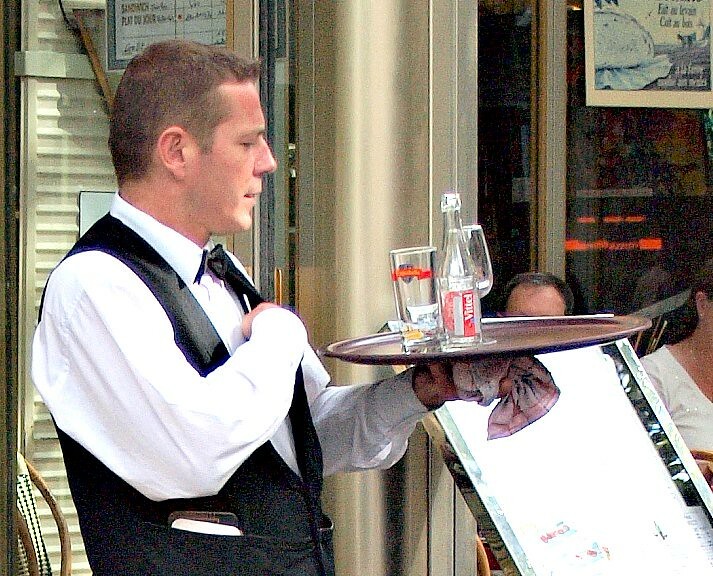 Many people are getting drinks to cool off – but how do you order drinks in Dutch? So, you decided to hit one of the many little terraces (terrasjes) in the city, sit down with your friends, and now you have the menu in front of you – but what can you order? Koffie and Thee are often served as a kop (cup), but are sometimes served as kan (pot). Koffie (Coffee) – A classic in the Netherlands. A lot of people drink coffee all the time – sometimes 5 or more cups a day! Especially in the afternoon, it is time for some coffee, often together with some cake (cake) or a koekje (biscuit/cookie). For the coffee, you need to know zwarte koffie (black coffee), koffie met melk (coffee with milk), koffie met melk en suiker (coffee with milk and sugar) and koffie verkeerd (wrong coffee). This last one is interesting. It refers to coffee where there is more melk than koffie, so it is wrong coffee, as it is rather milk with coffee. It is the wrong way around (verkeerd om). So traditionally, this is just hot milk, not frothed! Of course, there are also koffiespecialiteiten (coffee specialties), such as espresso, dubbele espresso (double espresso), cappuccino or latte macchiato. Thee (Tea) – A lot of people drink thee as well, though koffie is definitely drunk more. Thee exists in many varieties, such as groene thee (green tea), zwarte thee (black tea) or witte thee (white tea). You can also get thee with melk, sojamelk (soy milk), honing (honey) or suiker, of course. In the cold beverages, most dranken come either as klein (small) or groot (large). Bier op de tap / Bier van het vat (Beer on tap / Beer from the barrel) – This is bier put on the tap of the bar, and many people think it tastes better than beer from a bottle. Your call! Bier in de fles (Beer in the bottle) – This is bier in a bottle that you can get just like that – in the bottle. Because it is bottled and does not need to be served to a large amount of people, most speciaalbieren (special beers) are bottled, and not op de tap. Wijn (Wine) – Wijn! Of course, available in its different varieties. There is rood or rode wijn (red wine), wit or witte wijn (white wine) or rosé (rose wine). Then wine is either droog (dry), half-droog (half dry) or zoet (sweet). Additionally, you can find something like BGA (beschermde geographische aanduiding), or its French term more commonly, IGP (indication géographique protégée), which refers to an area where certain products are traditionally produced. This indication tells you that this product has been made there! A lot of wines carry such a label. Cocktails (Cocktails) – A classic, and mostly, the English terms are used here. You’ll figure this one out! Frisdranken mostly refer to different kinds of soda, from cola (coke) to sinas (soda with orange taste, such as Fanta or Orangina), to Sprite or 7Up. Fristi – Fristi is a sweet, milk-based drink. It comes in different smaken (flavors), but normally comes with the flavor rood fruit (red fruit). It is usually ordered for children. Chocomel / Chocolademelk (Chocomel / Chocolate milk) – Chocomel is the brand name for the best-known chocolate milk in the Netherlands. Jus d’orange / Sinaasappelsap (Orange juice) – this is just orange juice. Sometimes, the Dutch use the French term jus d’orange, or just jus. If it says vers geperst, it is freshly squeezed. If you want to know whether it is with vruchtvlees (pulp) or without, just ask. Water (Water) – Water comes from different brands in bottled form. What everyone in the Netherlands understands, though, is if you go with the brand Spa. Order a Spa blauw (Spa blue), and you will get water zonder koolzuur (water without gas), order a Spa rood (Spa red), and you will get water met koolzuur (water with gas). Kraanwater (Tap water) – Kraanwater is served for free more and more at restaurants around the country, though there are some places that still want to sell you bottled water or charge a little bit for kraanwater. Just ask for it! Ja, voor mij een biertje, alstublieft. (yes, a beer for me, please. (Usually, this will get you the beer on tap in either 0,2L or 0,33L). Ik zou graag een witte wijn willen. (I would like to have a white wine). Ik ben de bob vandaag, dus ik drink niet. Doe mij maar een koffie verkeerd. (I am the bob (person that’s driving) today, so I don’t drink. Just get me a wrong coffee). So as you can see, the Dutch are pretty straightforward when it comes to ordering. And that is totally acceptable. I hope this helped you a bit in your summerly endeavors in the Netherlands! Did I miss anything? Anything that confused you? Let me know in the comments below! Ik ben de bob vandaag. That’s a good one. It’s new to me.